Surface area and porosity are two important physical properties that determine the quality and utility of many materials. Differences in the surface area and porosity of particles within a material can greatly influence its performance characteristics. The ASAP 2020 Accelerated Surface Area and Porosimetry System makes it easy to obtain high-quality data for research and quality control applications. The system contains a multitude of data reduction methods and can be readily upgraded to perform micropore and chemisorption analyses. All options are designed to be integrated into the ASAP 2020 cabinet and require no additional bench space. Adsorption and desorption analyses using an extended range of adsorptives, including vapours, are also permitted. The ASAP 2020’s data reduction methods allow a high level of versatility, with a wide variety of experimental data options. Newly added methods include heat of adsorption, as (Alpha-s), Freundlich and Temkin isotherms and crystallite size. 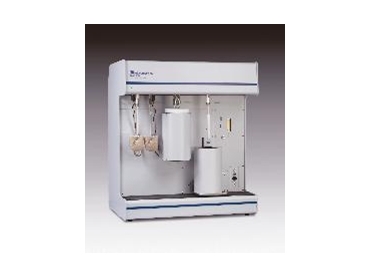 An automated thermal-vacuum degas station is available to provide the user with complete control of degassing, improve analytical results, and output a record of degassing parameters. The automated thermal-vacuum degas station also comes with a long-duration dewar, allowing long-term analyses to be completely automated without the need for refilling.